My first-ever Senior Portrait photo session happened, unfortunately, in the rain. Eli was constrained by a number of factors, including a deadline to turn in his photos and a double wisdom tooth extraction, so when the appointed day dawned gray and drizzly, we decided to go ahead with the photoshoot anyway and see what we got. I was actually pleased with the results in spite of the challenges -- it took some work to digitally edit out the water droplets on Eli's glasses in many of the photos, but the wet conditions created saturated colors and even lighting that was preferable, in some ways, to the harsher lighting of a sunny day. 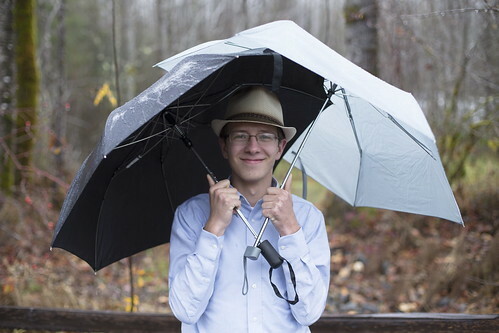 This particular photo happened when I accidentally dropped my hat in a nearby creek and Eli's dad went to fetch it, leaving his umbrella with Eli. I had to laugh at the handsome young man standing huddled under double umbrellas. "This one's an outtake," I said as I snapped the photo of his wry grin. I'm sure it won't be his chosen senior portrait, but it's one of my favorite images from the set.